1.Prepare Italian Filling: In large nonstick skillet, cook mushrooms, sausage and tomatoes over medium heat 8 minutes or until sausage is cooked through, stirring frequently. Remove skillet from heat; drain off fat and cool slightly. Stir in shredded cheese and basil. 2.Meanwhile, prepare Burgers: Prepare outdoor grill for direct grilling over medium heat. Form meat into eight 1/4-inch-thick patties; sprinkle with salt and pepper. Divide filling evenly onto center of 4 patties, spreading filling to within 1/2 inch of edges. Top each with remaining 4 patties. Pinch edges together to seal. 3.Place burgers on hot grill rack. Cover and cook 15 minutes or until internal temperature reaches 155º for medium doneness, turning once. Top patties with cheese slices during last minute of cooking. 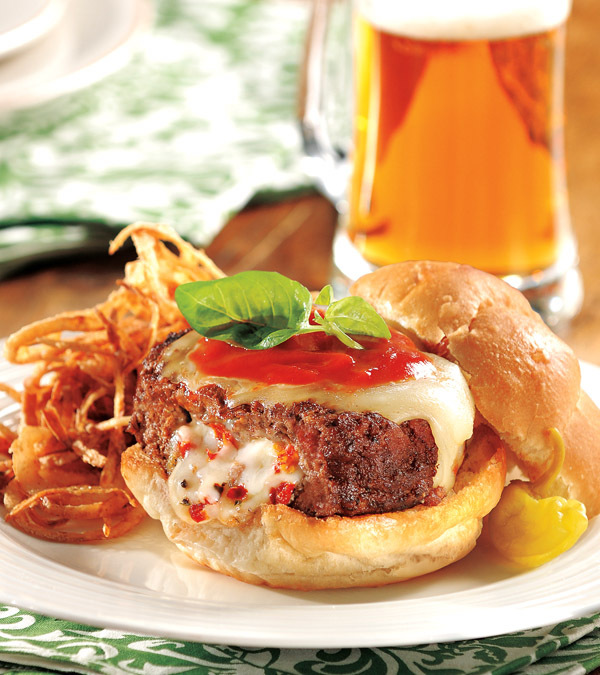 Serve burgers on buns with toppings of choice. 1.Prepare American Filling: In large nonstick skillet, cook bacon over medium heat 5 minutes or until crisp, stirring frequently. Add mushrooms, onions and bell pepper and cook 5 minutes, or until vegetables are tender, stirring occasionally. Remove skillet from heat; drain off fat and cool slightly. Stir in shredded cheese. 1.Prepare Southwest Filling: In large nonstick skillet, cook green chiles, onions and corn over medium heat 5 minutes, stirring occasionally; remove from heat. Stir in cilantro and lime juice; let cool. Stir in cheese.